The very first of these high-flying adventurers was Tailspin Tommy, who debuted on May 21, 1928. Tommy Tomkins showed an interest in aviation from a very early age — so strong that his neighbors in Littleville, Colorado nicknamed him "Tailspin Tommy" before he even saw the inside of a real airplane. He got his first chance to do so when mail pilot Milt Howe made an emergency landing in a nearby field and found Tommy, who had seen the troubled descent and came running to help, waiting on the ground. Milt helped Tommy get a job fixing planes at Three Point Airlines in Texas, and Tommy jumped at the chance. Before long, he was piloting them on his own — in fact, within a few years, he, his pal Peter "Skeeter" Milligan, and his sweetheart, Betty Lou Barnes, had become part owners of the company. It was, of course, no coincidence that Tailspin Tommy started almost exactly a year after Lindbergh's historic flight. 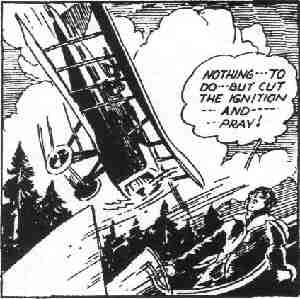 John N. Wheeler, who ran Bell Syndicate (Mutt & Jeff, Miss Fury), decided on an air adventure strip upon seeing the public's response to Lindbergh, and hired scripter Glenn Chaffin (who later wrote Flyin' Jenny, about a female aviating adventurer) and illustrator Hal Forrest (who had earlier done Artie the Ace, a humor strip about flying), to create one for him. The title resulted from a brainstorming session — someone mentioned "tailspin" as a good action word about airplanes, and "Tommy" was added to alliterate with it. The strip started in only four papers, but quickly caught on with readers, and its client list expanded to about 250. A Sunday page was added on October 20, 1929. Before long, it was a multi-media phenomenon, with a couple of reprint books, a radio series, and about a dozen Big Little Books. CHJ Publications put Tommy in a pulp magazine, a rare honor for a comic strip star, but it lasted only two issues (October 1936 and January 1937). It was reprinted in the first modern-style comic book of all, Famous Funnies #1. Later, Dell Comics reprinted the strip in the back pages of The Funnies and Popular Comics, and United Feature Syndicate (which had taken over its distribution in 1939) published a pair of Tailspin Tommy comic books, one as an issue of Single Series in 1940 and the other as a oneshot in '46. Tommy also had a minor career in movies, starting in 1934, when Universal Studios (Jungle Jim, Tim Tyler) released a 12-part serial about him — the first movie serial about a comic strip character, by the way. Maurice Murphy played the title role, with Patricia Farr as Betty Lou and Noah Beery Jr. as Skeeter. A year later, the same studio put Tommy in a second 12-parter, Tailspin Tommy & the Great Air Mystery, with Clark Williams as Tommy, Jean Rogers as Betty Lou and Beery again playing Skeeter. During 1939 and '40, Monogram Pictures released four features in which Tommy was played by John Trent, Betty Lou by Marjorie Reynolds, and Skeeter by Milburn Stone. But Monogram had originally contracted for six features, and ended the series early due to declining popularity. Chaffin had left in 1933, reportedly because he and Forrest didn't get along, and Forrest's solo product didn't seem to interest readers as much. Also, the wearing off of the novelty, and increased competition from Barney Baxter, Smilin' Jack and the like, took their tolls. The strip ended in 1942, and with it, the media extravaganza. Except for that 1946 comic book from United Feature, and a reprint volume decades later from Ken Pierce Books (which also reprinted Alley Oop, Modesty Blaise and many others), that was the end of Tailspin Tommy.